A marine expert has urged the local government and other concerned agencies to reinforce the implementation of ordinances that protect Davao Gulf and all other bodies of water in the city. “We have so many existing local laws in the city but these are implemented for only a month and then we boast about it. But in the long run, the implementation would stop,” Darell Blatchley, the president of D’ Bone Collector Museum Inc., told reporters in the sidelines of yesterday’s city council session. “There are also laws that are implemented only to selected areas. If you look at poor areas, there is a lenient implementation of laws. But these laws should be implemented to all, regardless of social status… to discipline the people,” Blatchley added. Among the laws that safeguard the city’s water resource include the Marine Protected Areas Ordinance of 2007, and the Water Management and Protection Code of Davao City. The call for the enforced implementation of local laws is raised after the news of a dead juvenile Cuvier’s beaked whale found in Mabini, Compostela Valley made headlines globally. 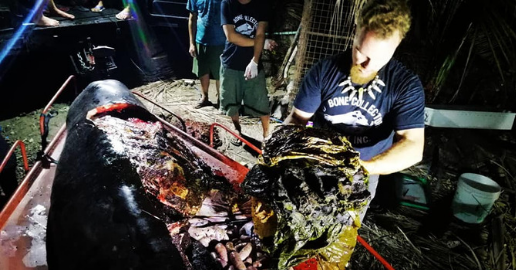 “The 40 kilos of plastic found inside the stomach of that whale is the most ever found in a whale or dolphin worldwide,” said Blatchley, a Datu Bago awardee. Blatchley noted that even if the plastics inside the said whale may not be directly from the city, other animals have been found dead in the Davao Gulf that have ingested plastics. “The fact that they are dying here in the Davao Gulf raises the awareness that the city is a hotspot of endangered animals,” Blatchley said. In the last 10 years, Blatchley reported that the museum has recovered 61 dead whales and dolphins, including 57 that died because of plastic fishing nets, dynamite fishing and plastic ingestion. Among the 57, four were pregnant. “These numbers do not even include other animals like turtles that also died here,” Blatchley said. Blatchley also explained the waste generation situation in the Philippines. “If you look at the Davao Gulf, we have 18 known species of whales and dolphins but we have noted several deaths because of plastic. Worldwide, there are three main waste-producing countries; China with a billion of people, then Indonesia, and the Philippines with only a hundred million people,” Blatchley said. “If you look at the amount of garbage per person, compared to China, Philippines should be number one,” he added. Blatchley also urged businessmen to come up with innovations that will opt out or reduce the use of plastic.